This lithograph is taken from plate 18 of Emily Eden's 'Portraits of the Princes and People of India'. Eden described the image on the left as one of "a favourite and successful young student at the Hindoo College, in Calcutta, where scholars acquire a very perfect knowledge of English, and have a familiarity with the best English writers which might shame many of our own schools. The Hindoo youths have an extraordinary aptness and precocity as scholars, and their exhibitions are very interesting and gratifying. This young student, who was the son of a native gentleman of rank in Calcutta, recited English poetry with particular grace and propriety." 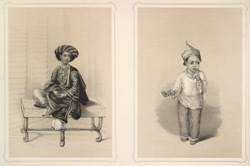 The second image is of a child of one of the Muslim servants of the Governor-General.